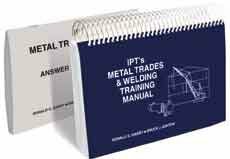 Pipefitter.com > IPT Publishing & Training LTD.
IPT Publishing provide a whole series of Handbooks and matching Training Manuals. They have the same info inside but the training manual are larger and spiral bound. The training manuals also have section questions plus an answer book for training programs. The IPT books cover a range of fields such as pipe fitting, electrical, rotating equipment (Millwright), crane and rigging, Fasteners, Industrial trades, Metal trades and welding, Hydraulics, Construction Job safety, and finally from somewhere: IPTs Guide to Interpreting Blueprints. This was an well needed IPT book.